View Championship Team Pics here. The Sr. 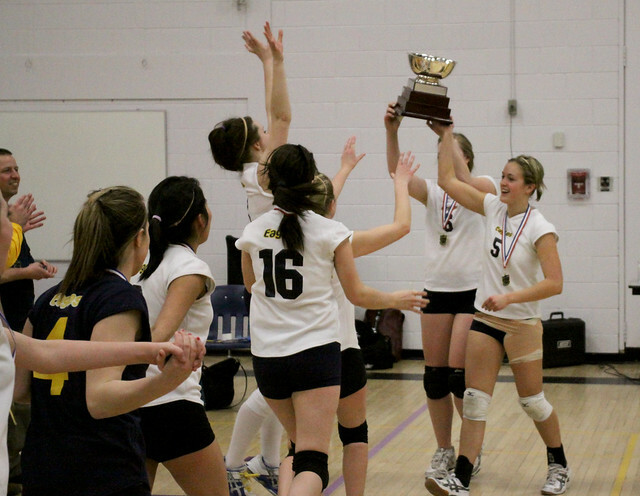 Girls have an automatic OFSAA berth due to Dryden winning the OFSAA silver medal last year. Fort Frances will play St. Ignatius for the second NWOSSA spot. The Junior Boys Basketball team are NorWOSSA Gold Medalists after defeating the Beaver Brae Broncos 61-37. Leading scorers were Nick Skillen and Shane Kirton with 14 each, and Kurtis Burnell with 11. DHS Senior Girls Volleyball have defeated the Fort Frances Muskies in four games to capture the NorWOSSA Gold Medal. (22-25, 25-14, 25-13, 25-13). The Senior Boys Basketball team are Bronze Medalists after ending their season with a 36-24 semifinal loss to the Beaver Brae Broncos.